The chairman of Russia’s lower house has told lawmakers that instead of “playing” with sanctions and bargaining over the fate of refugees, all civilized nations should unite their efforts in fighting terrorism. “The terrorists have delivered a cowardly strike on completely innocent people. At the same time, the politicians and governments from the EU and NATO countries, instead of taking resolute measures to fight terrorism, are busy announcing all types of sanctions that deeply violate the basic rights of millions of citizens. 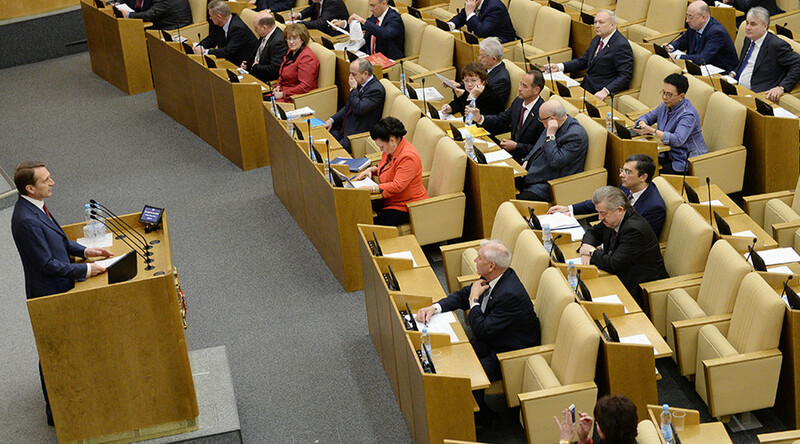 Besides, they start to bargain over the fate of hundreds of thousands of refugees from Mideast and North Africa regions,” Sergey Naryshkin MP (United Russia) said at the State Duma plenary meeting on Tuesday. “The civilized world must unite in fighting against the common threat of international terrorism,” the Duma chief said. The head of the lower house Committee for Eurasian Integration, Leonid Slutskiy MP (LDPR), told reporters that in his view European nations must actively cooperate with Russia to defeat international terrorism. “While Europe was dancing to the American songs that called Russia the main threat to world security in the 21st century, the real threat penetrated the very heart of the European continent,” the Russian lawmaker said. “Russia is ready for effective cooperation with Europe in fighting international terrorism that can only be defeated by common effort,” he added. The chairman of the Parliamentary Committee for International Relations, Aleksey Pushkov, also made a remark concerning the anti-Russian sentiments that dominated European politics over the last few years. “In times when [NATO Secretary General Jens] Stoltenberg is fighting the imaginary Russian threat and deploys troops to Latvia, people are getting killed by blasts right under his nose in Brussels,” Pushkov wrote on Twitter on Tuesday. The Russian politician also used his microblog to offer condolences to the relatives of the victims and once again emphasized that Europe should understand where the real threat to security comes from.